"Gone Coastal" is the perfect place for a family getaway! 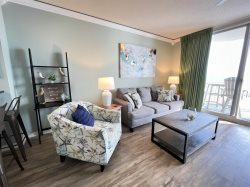 Decorated in blues and greens that compliment the emerald waters of the Navarre Beach coast, which can be seen through its floor to ceiling windows.This spacious beachfront 3 bedroom 2 bathroom sleeps up to 12 people comfortably. The master bedroom hosts a king bed with the most spectacular view of the water. Who wouldn't want to fall asleep with the view of the Gulf of Mexico in their room! As well as its own private bathroom with a whirlpool tub and walk in shower. The first guest bedroom also has a king bed, making this unit perfect for friends and family that are traveling together. The second guest bedroom is perfect for children or teenagers. This room comes equipped with two bunks, with a full size mattress on the bottom and a twin on top, sleeping up to six people in this room. The living room has a sofa that folds out to a queen sleeper. For the time that your family doesn't want to spend with their toes in the sand, the large balcony is the perfect spot to take in the views and the beach breeze. So come take some time to dip your toes in the Gulf of Mexico. Very attentive, friendly and helpful. Great customer service! Great condo. Many plus. Comfy beds, NICE view of beach, etc. The kitchen and porch was pretty small for 11 people. The pool stayed crowded. I would say this is perfect for smaller group. I have stayed at summerwind before and their condos are my favorite! This place was awesome.There were 12 of us total.. Ages from 6-56 and everyone had fun! The condo was excellent. Spacious and very well taken care of. The view fantastic !! We had everything we needed right there. It was clean and well maintained.The staff friendly and spoke to us every time. (southern hospitality)at it's finest.We are planning another trip next year.We can't wait to return.Thank you!! great team to work with. Friendly and helpful. Great condo. Lots of room. Well arranged. Comfortable beds.